Globalization is the defining feature of the new millennium. Curiosity about the world beyond our national borders is not new, but the rapid pace of change across increasingly interdependent societies alerts us that global perspectives are now essential, not optional. Motivating these changes are advancing technologies, which provide not only instant access through computers, smart phones, and tablets, but also connectivity across all sectors of modern life. We now share a global economy in which the financial crisis in Greece will have reverberations in the stock markets of New York and Tokyo. Social media has become a force for global change. Scientific and health challenges are inherently global in scope. Globalization acknowledges that humanity is co-dependent as never before. This symposium examined how the global imperative is profoundly and pervasively influencing all aspects of higher education. For example, the large influx of international students at U.S. institutions brings a rich diversity of global experiences into the classroom; however, it also poses challenges for faculty members to accommodate a wider range of backgrounds, cultures, and educational expectations. How does the new global classroom provide an impetus to rethink teaching and learning in the 21st century? How can faculty incorporate global perspectives into their courses? How does the presence of international students change learning? How can institutions ensure that study abroad experiences are an integral and interconnected part of education rather than a superficial experience of intellectual tourism? What strategies are U.S. colleges and universities implementing to establish effective partnerships with educational institutions in other countries? 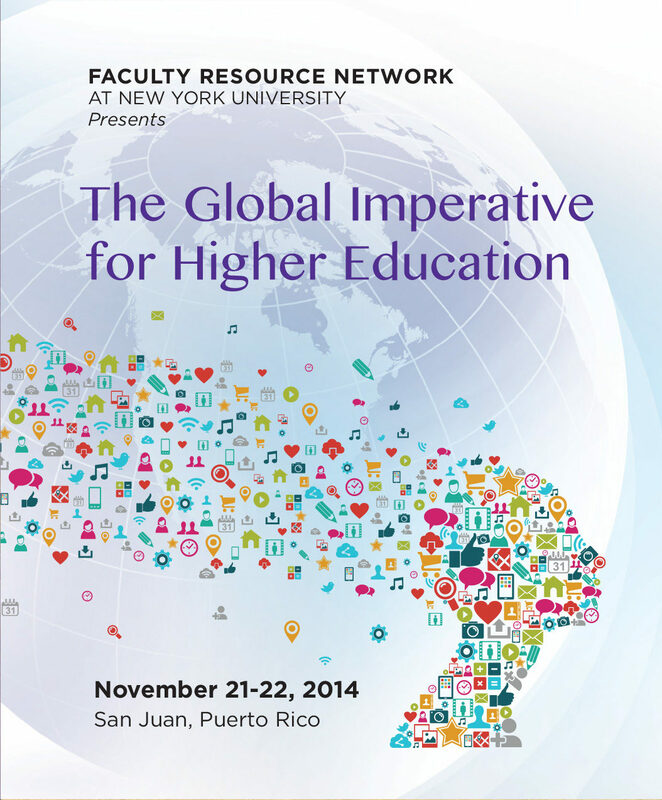 In November 2014 faculty members and other representatives of Faculty Resource Network institutions addressed these questions and issues during a national symposium on The Global Imperative for Higher Education, held in San Juan, Puerto Rico, and co-hosted by the University of Puerto Rico and the University of the Sacred Heart. In this twelfth issue of our online NETWORK: A Journal of Faculty Development, we present excerpts from a number of the presentations that were delivered during that symposium. Keynote Address by President John Sexton, New York University. Remarks from President Gilberto Marxuach-Torrós, University of the Sacred Heart. Remarks from President Uroyoán R. Walker-Ramos, University of Puerto Rico. Excerpts from a presentation by Susan Davenport, Stockton University, and Sonia Gonsalves, Stockton University. Excerpts from a presentation by Wendy P. Hope, St. Joseph’s College. Excerpts from a presentation by Ellen Navarro, Wagner College, and Patricia Tooker, Wagner College. Excerpts from a presentation by April D. Lundy, Clark Atlanta University, Rosalee Martin, Huston-Tillotson University, Alice E. Stephens, Clark Atlanta University, and Andrew Will, Clark Atlanta University. Excerpts from a presentation by Jane Collins, Pace University. Excerpts from a presentation by Jeffrey Gaab, Farmingdale State College. Excerpts from a presentation by Shawn Riva Donaldson, Stockton University. How Can Colleges & Universities Assist International Students In Their Classroom & Campus Culture? Excerpts from a presentation by Kimberly Jackson, Spelman College, Yassin Jeilani, Spelman College, Shanina Sanders, Spelman College, Albert Thompson, Spelman College, and Leyte Winfield, Spelman College. Excerpts from a presentation by Karima K. Jeffrey, Hampton University, Valerie Ann Johnson, Bennett College, Lynette Ralph, Xavier University of Lousiana, and Pamela Waldron-Moore, Xavier University of Lousiana. Excerpts from a presentation by Elena Lawton de Torruella, University of the Sacred Heart. Excerpts from a presentation by Diane J. Fulton, Clayton State University, Richard A. Fulton, Troy University, and Thomas W. Garsombke, Clayton State University. Excerpts from a presentation by Aida Andino-Pratts, University of Puerto Rico, Río Piedras Campus, Anamari Irizarry-Quintero, University of Puerto Rico, Río Piedras Campus, Juan Antonio Peña-Hevia, University of Puerto Rico, Río Piedras Campus, and Carmen Sierra-Monroig, University of Puerto Rico, Río Piedras Campus. Excerpts from a presentation by Tiffany Packer, Johnson C. Smith University.